So I finally took pictures & used this INGLOT 10 Square Eyeshadow Palette that I got in April (April!) I'd over-swatched & obsessed over all the colors at the store, so I already knew I'd have no complaints about the quality of any of them. They're all amazing! 463 DS ~ Ivory with sparkly gold shimmer. Perfect for the inner corners. 341 Matte ~ A pale peachy pink. It'll be used for blending, but it can be used as a subtle blush too! 37 Shine ~ Metallic Bronze. Always wearable. 460 DS ~ Taupe with gold & silver shimmer. This was love at first sight. 326 Matte ~ This is so far my favorite deep cool brown eyeshadow. It's so silky! 464 DS ~ Terracotta with gold shimmer. I would wear this with 504. 71 AMC ~ Purple with silver shimmer. It's hard to find purple eyeshadows that are pigmented, but this is pretty good. 504 DS ~ Turquoise blue with silver shimmer. I'm loving this on my eyes these days. I wore it only on my lower lash line the other day, and applied it with a wet brush. 482 DS ~ Prussian blue with silver shimmer. It's absolutely gorg! It pops when worn over a cream e/s, like Maybelline Color Tattoo. 464 and 504 are gorgeous! I really want 504 now... I believe I don't have anything like it. Very pretty... 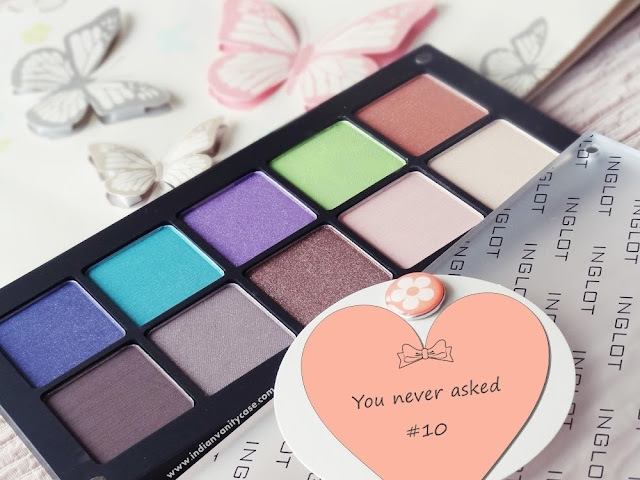 I've had my eye closely on Inglot for awhile now and I'm going to purchase my first shadows soon! I lovedd the first row !